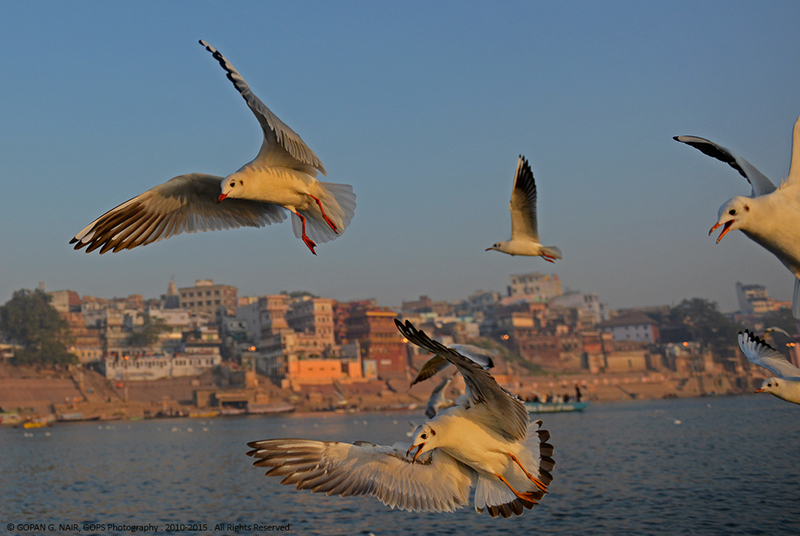 VARANASI ( Also known as BENARAS or KASHI ) is the oldest living city in the world with a known history of over 3000 years. 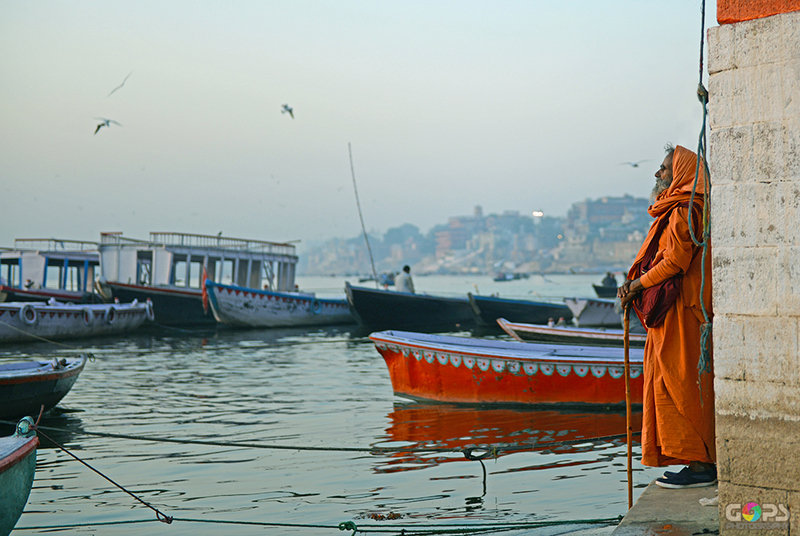 Mark Twain once wrote, “Varanasi is older than history, older than tradition, older even than legend and looks twice as old as all of them put together.” This historic city existed even when Sri Budha was a young boy. 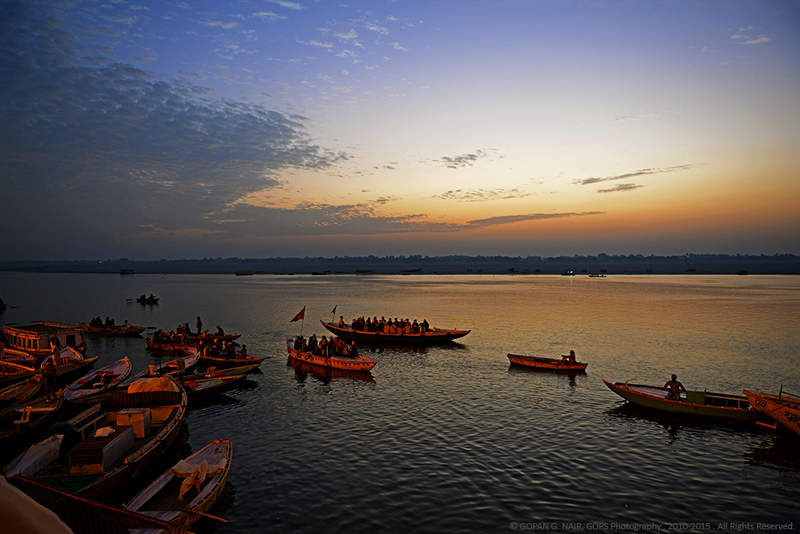 Varanasi belongs to the Indian state of Uttar Pradesh, situated by the west bank of holy Ganga River. 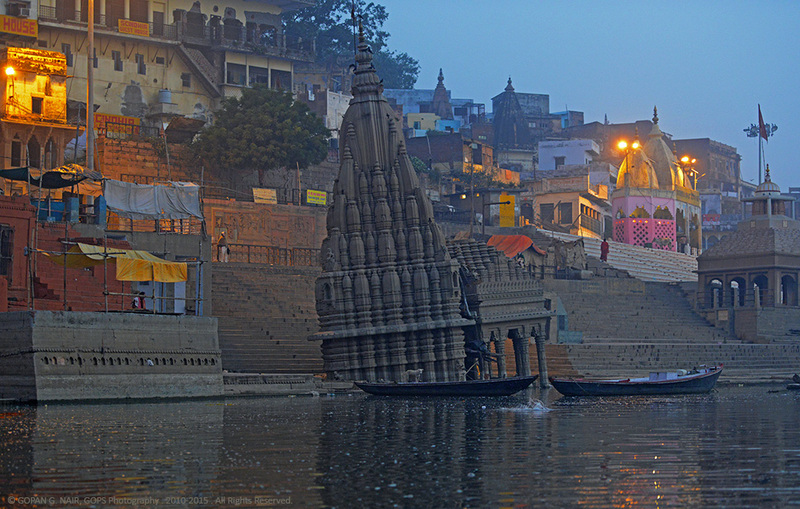 The revered and ancient city Varanasi is the religious centre of the world of Hindus, Budhists, Jains & Sikhs. 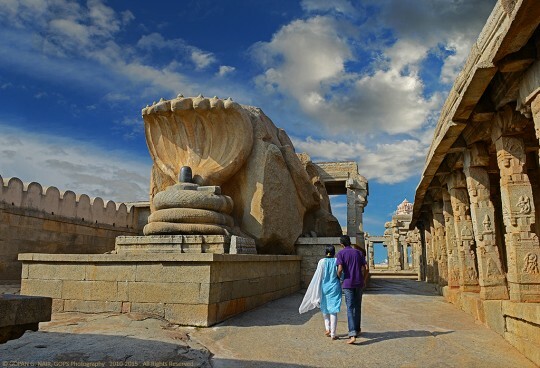 Even after several centuries of destruction by Mughals & other invaders, this city still stands, where the past & present, eternity & continuity, philosophy & wisdom co-exist. 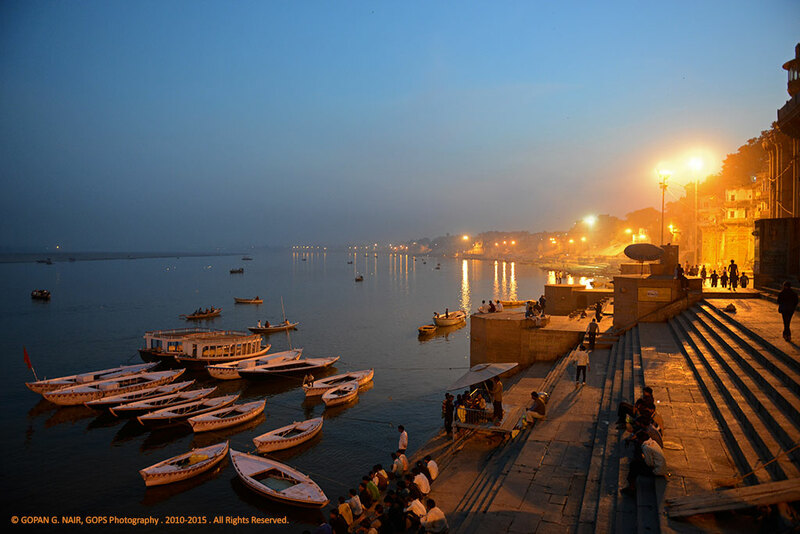 To Hindus, Kashi is as holy as Mecca to Muslims & Jerusalem to Christians. 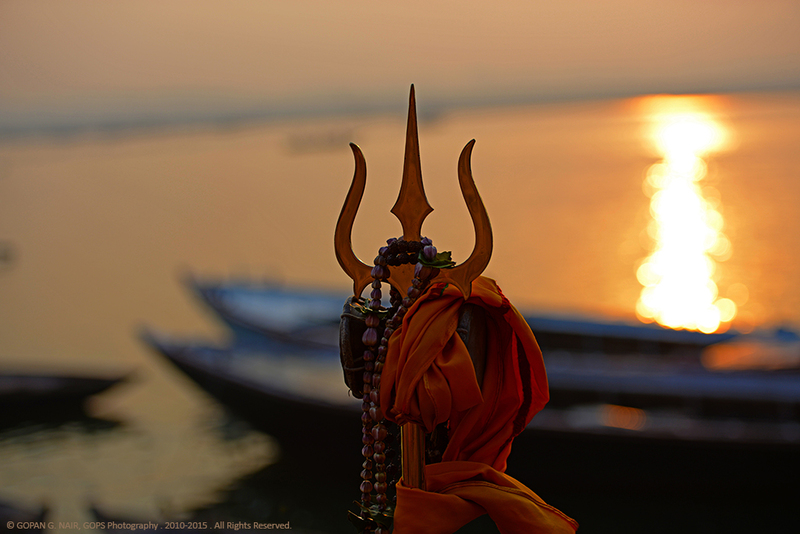 There is a common belief that you need to get an invitation from the God to visit Varanasi. I feel this has some significance in real life too. Though I used to procrastinate a lot, the trip got materialized unexpectedly, when I was not really prepared for it. 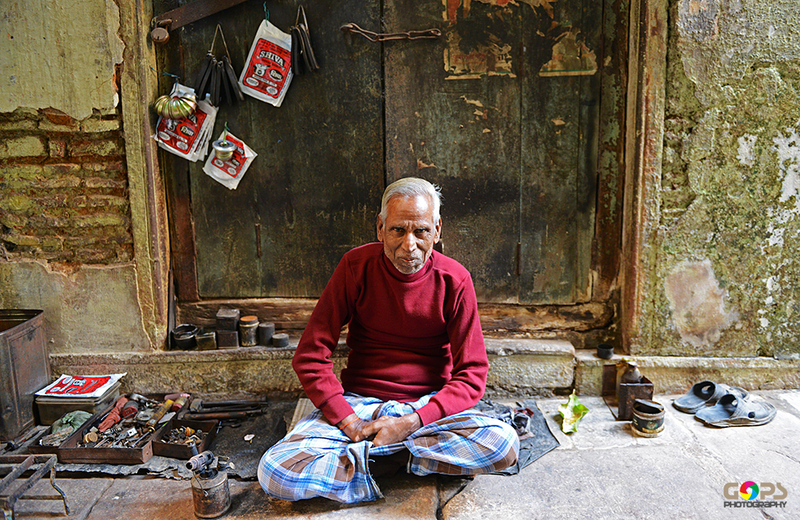 One of the main attractions in Varanasi must be its street life, and it is perhaps a dreamland and training ground for every photographer. 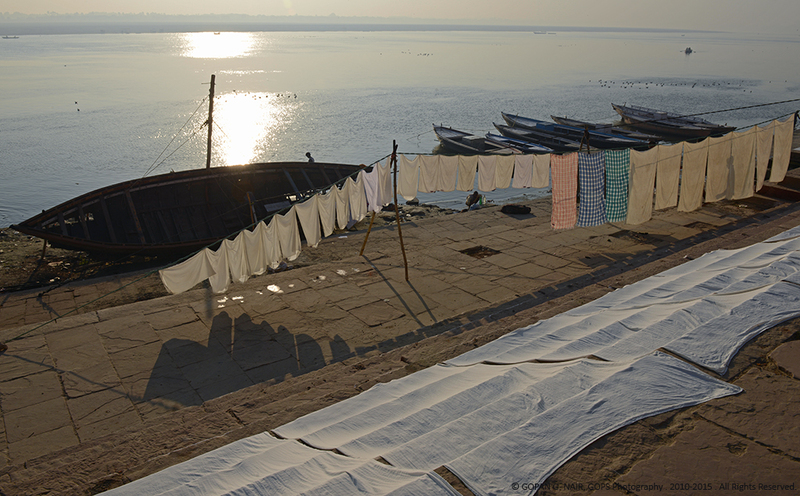 In this series, I have tried to capture the spiritual moments and street life of Varanasi without losing the charm. 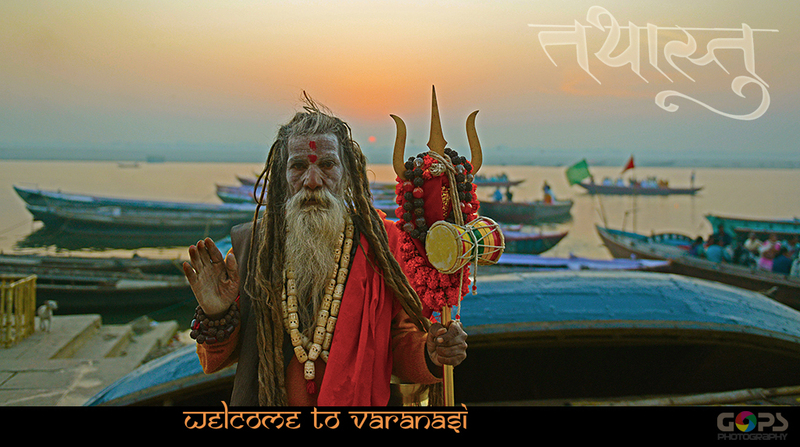 The main characteristics of Varansi are the ‘Galis’ and ‘Ghats’. 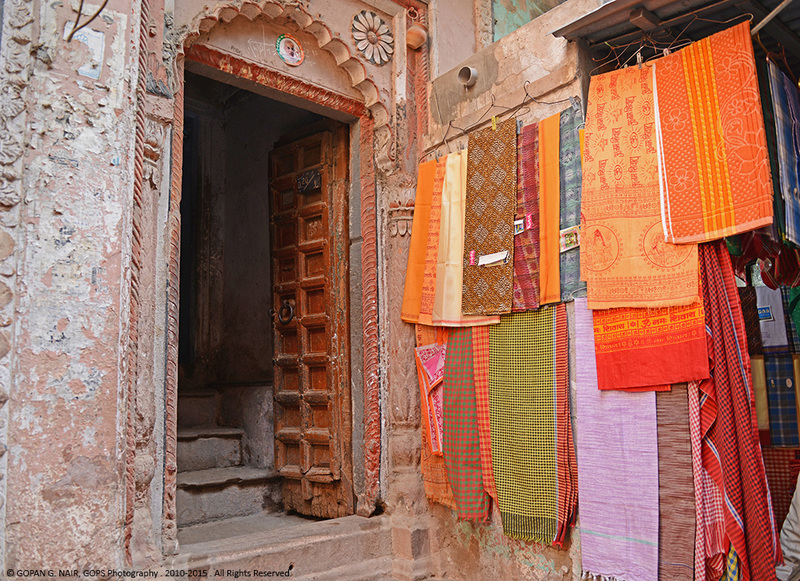 Gali means narrow passage or alley that takes you around the old city. 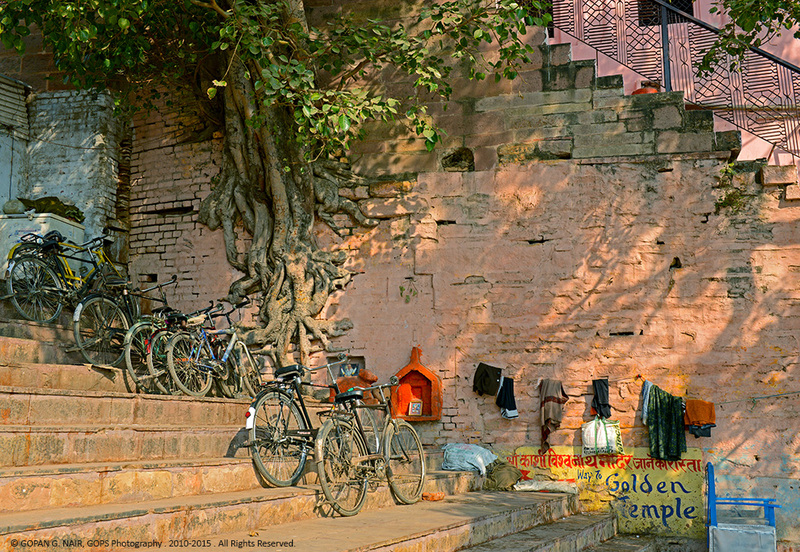 There are too many twists & turns in the narrow Galis and you could easily get lost the first time you land here. Keep a watch of some land-marks or you may never find your way back to the hotel. 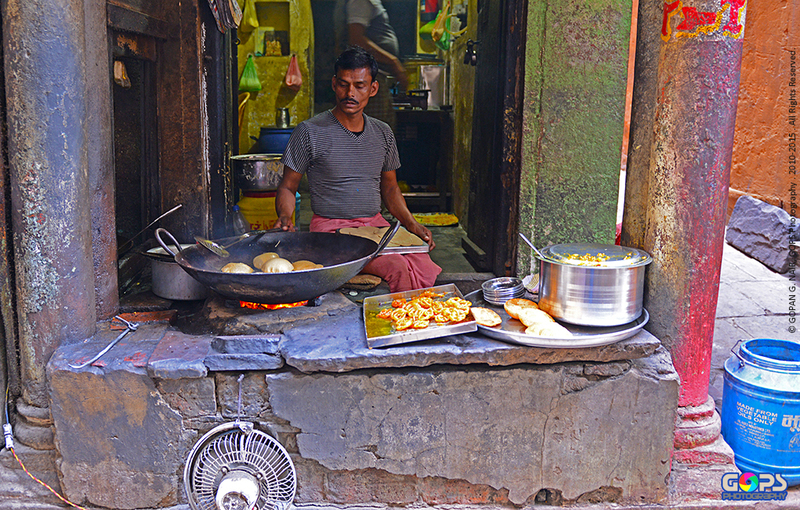 Galis are the main happening places in Varanasi and every nook and corner of the Gali is a photographer’s delight. 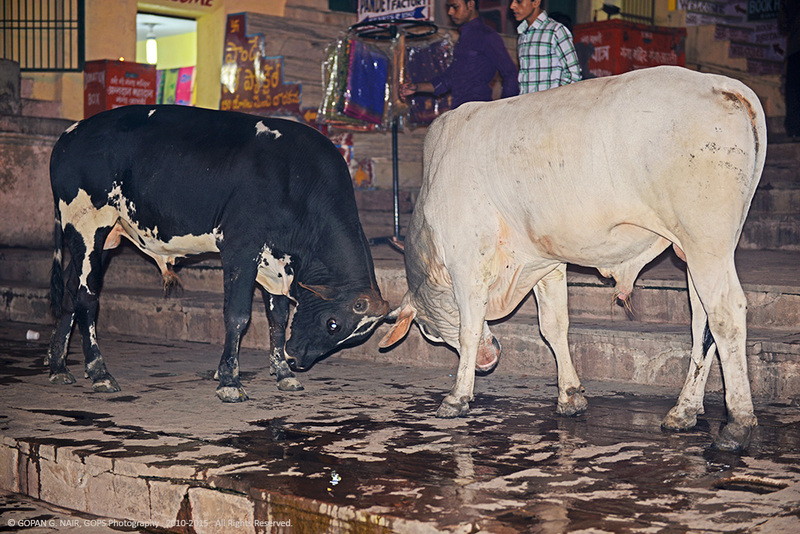 Remember that the cow is considered a holy animal in India and they literally rule these galis. 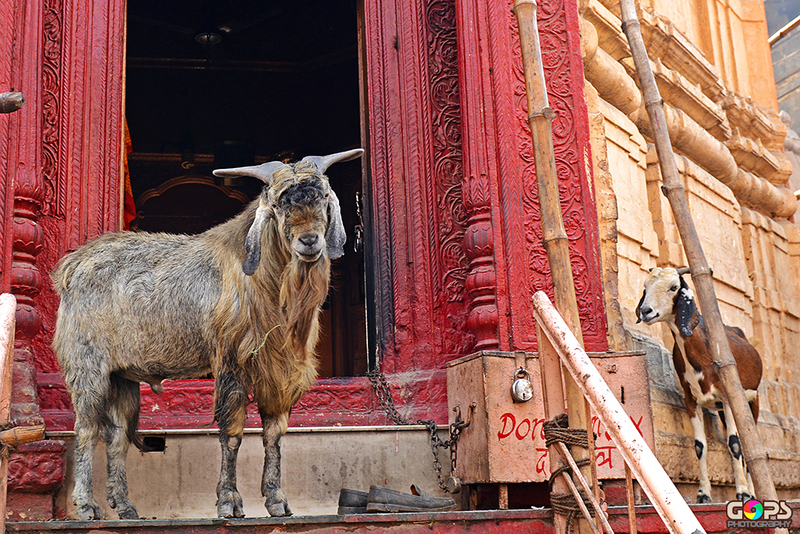 Though most of the cows, bulls and goats are harmless and interested only in a bite of garbage, there are some really mischievous monkeys who could cause some serious damage to your belongings. 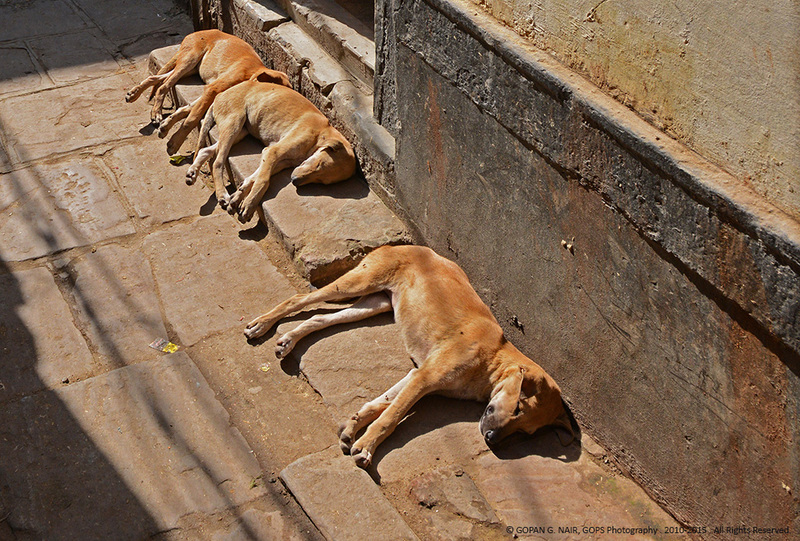 Remember, these streets are extremely dirty and unhygienic . Come here only if you are ready to accept it the way it is. At several places in the Galis, there are steps leading to the banks of Ganga river which are known as Ghats. 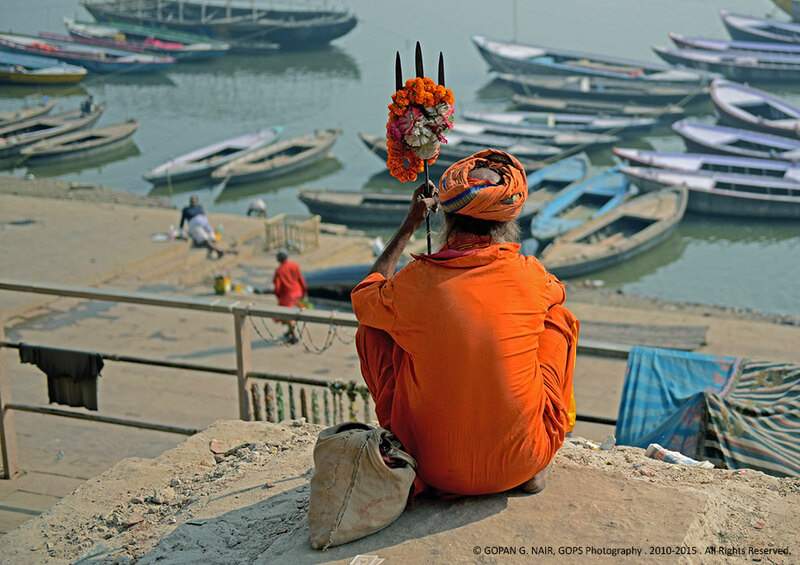 A Ghat is where people take bath in Ganga river, perform religious rituals, take a boat ride or burn dead bodies. 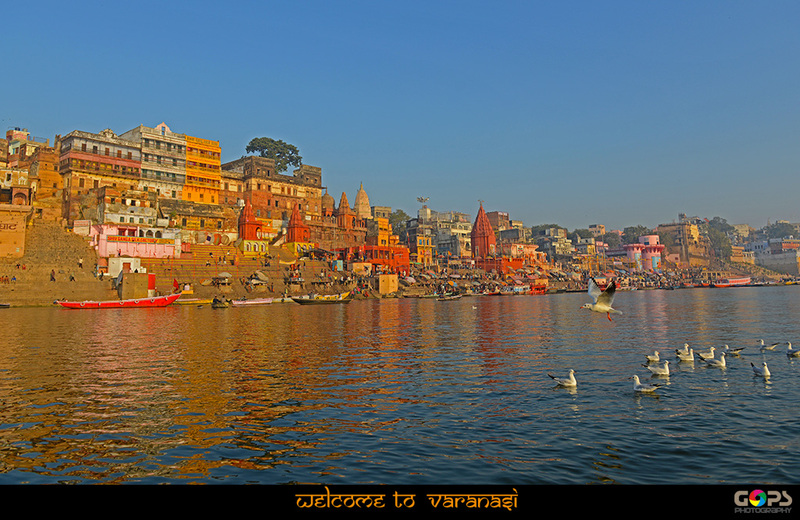 There are 87 ghats in Varanasi, the main ones being : Assi Ghat, Tulsi Ghat, Dashashwamedh Ghat, Manikarnika Ghat and Harishchandra Ghat . 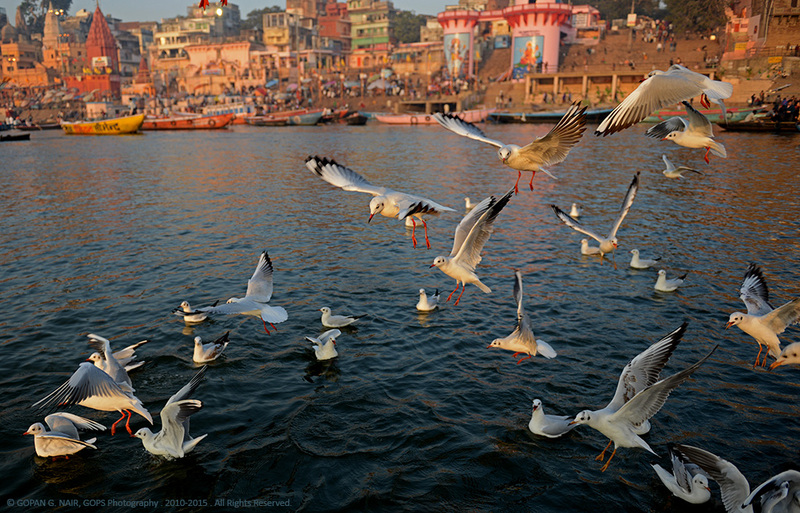 Out of these, Dashashwamedh Ghat is the most spectacular one where the religious rituals are being performed by thousands of pilgrims every day. 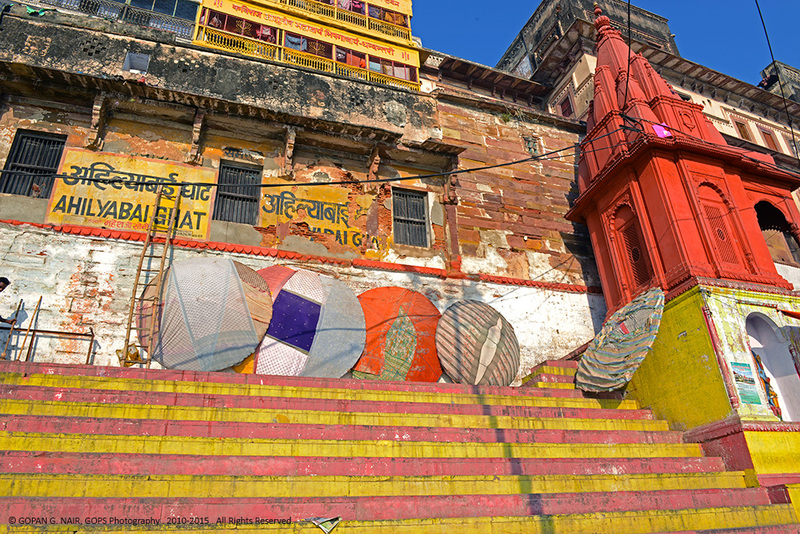 Kashi Vishwanath Temple is situated close to Dashashwamedh Ghat. 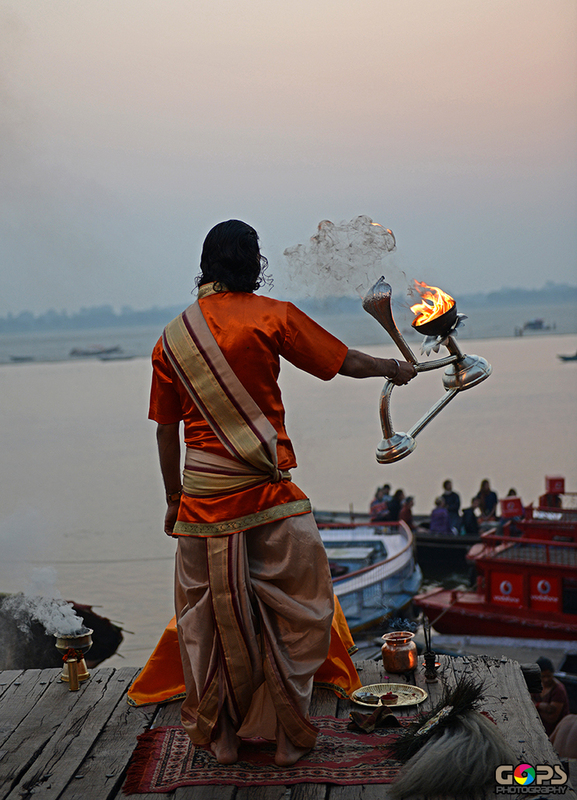 One should not miss the Ganga Aarti (river worship) performed here every morning and evening. 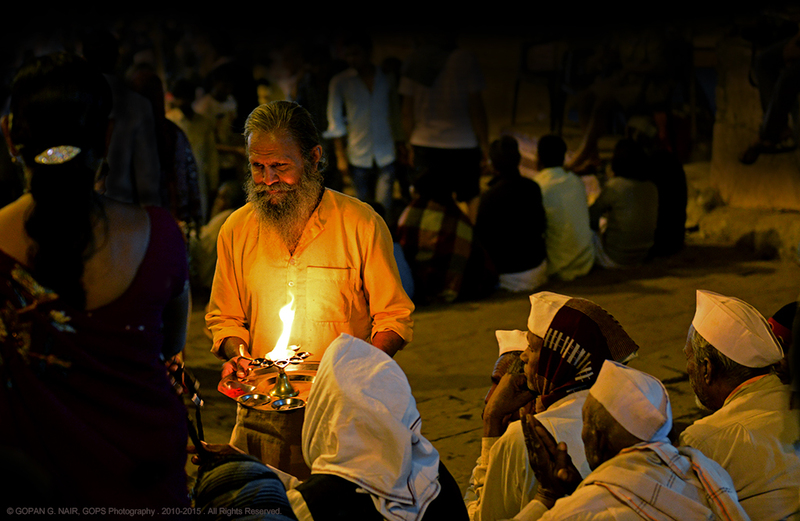 Believers usually go into a state of spiritual ecstasy while watching this colourful ceremony. 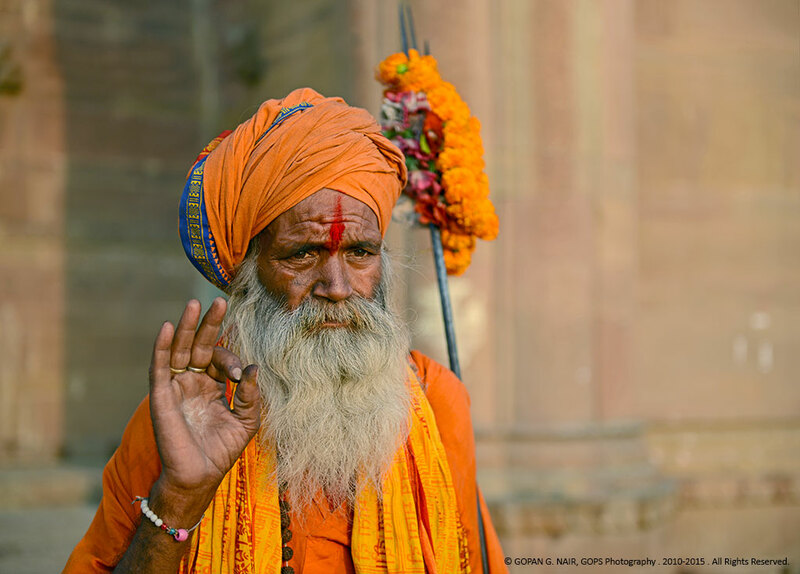 Beware of those extorting sadhus, touts and locals while photographing the street life at Varanasi. 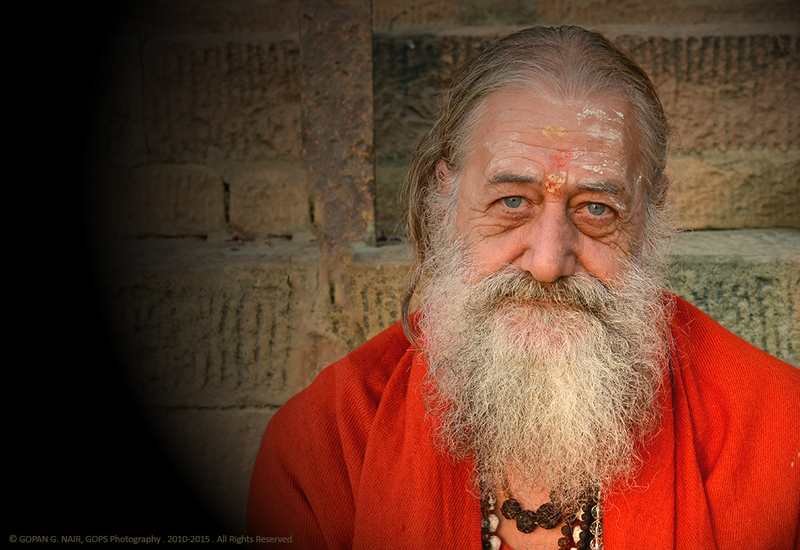 One fine morning, when I was shooting the sunrise, a Sadhu came charging towards me and started shouting at me. Usually a few bucks could cool them down. 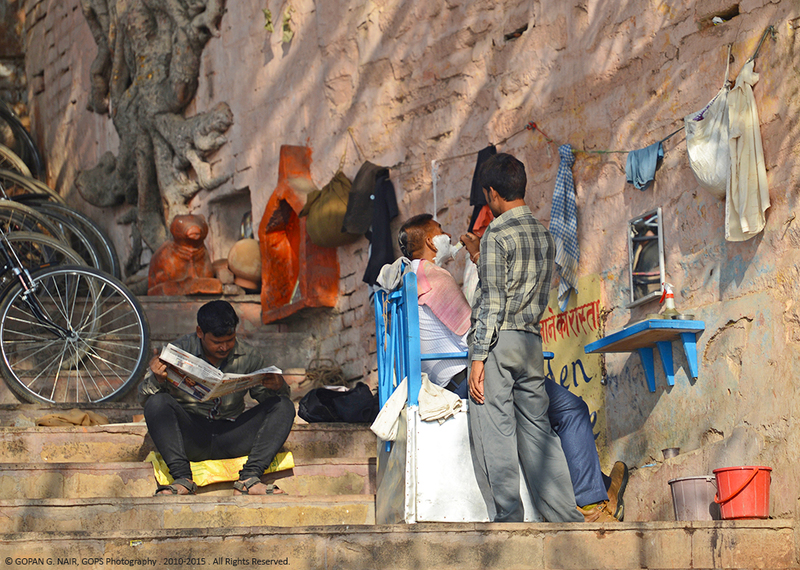 I was also threatened by a few locals at the Manikarnika Ghat (a Cremation place) while photographing the cremation ritual. 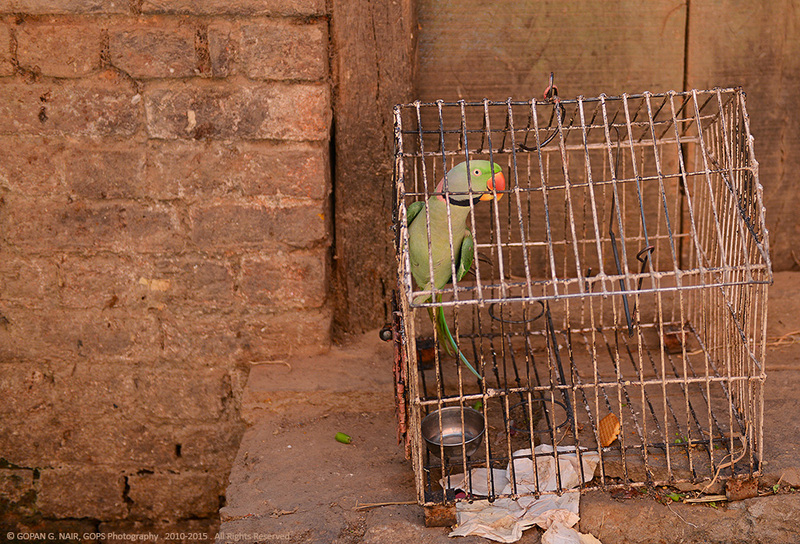 Be careful while dealing with such aggressive locals or you could land in serious trouble. But, believe me, most of the local people I met were really smart and talented. Many of them used to speak several languages and very helpful as well. The river is lively from dawn to dusk . 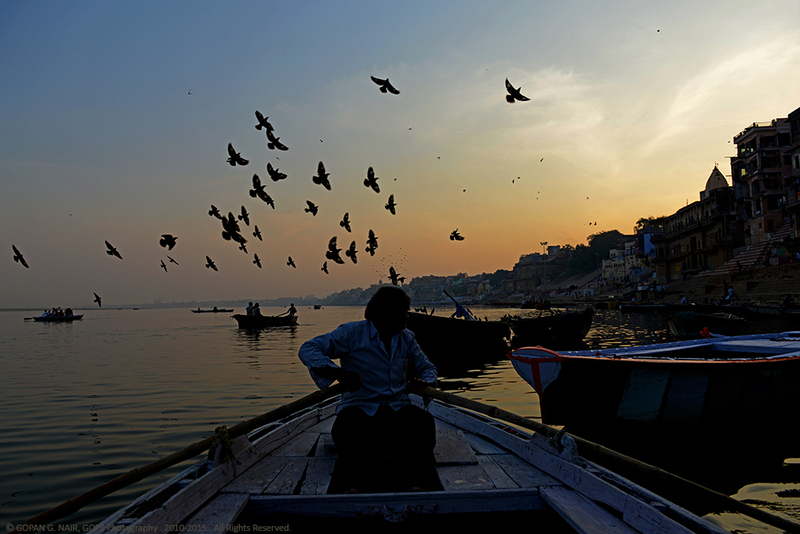 You can hire a rowing boat and go for a one hour ride from Dashashwamedh Ghat to Harishchandra Ghat and back. 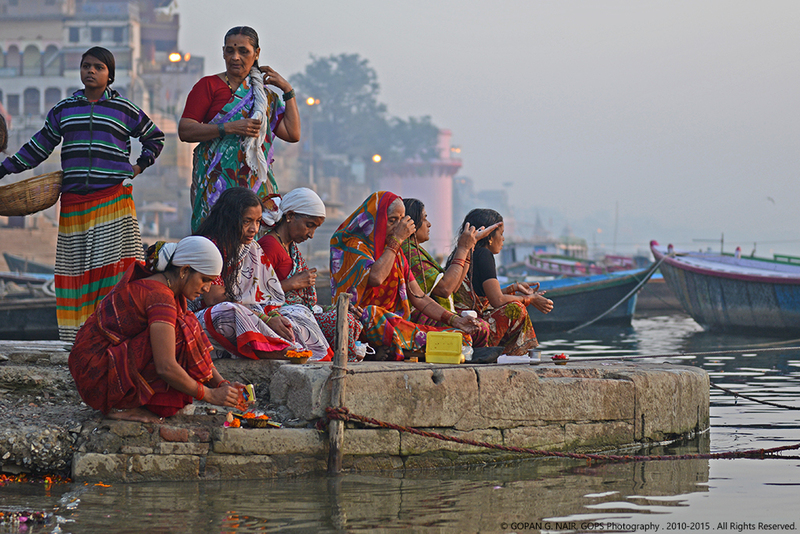 Early in the morning when the sun rises, it is really interesting to watch the colourful ghats and the pilgrims indulged in their daily bath and other religious rituals. 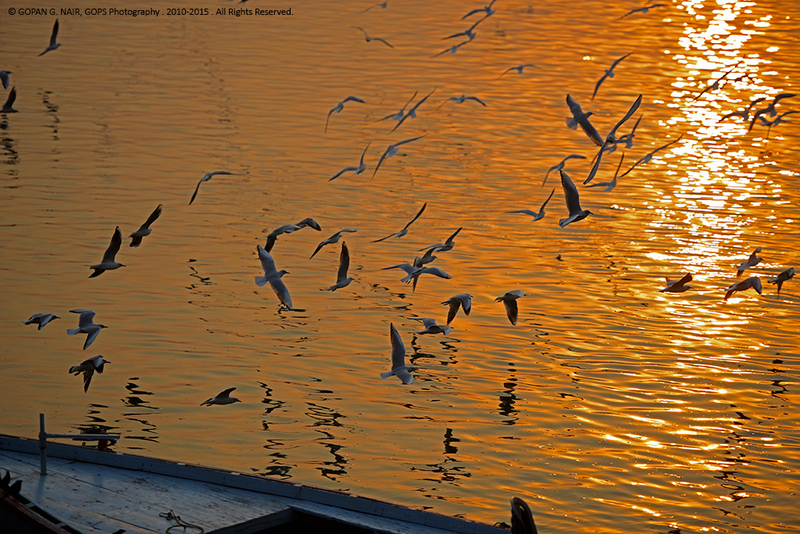 Hundreds of seagulls accompany you during the boat ride and if interested, you may please feed them. 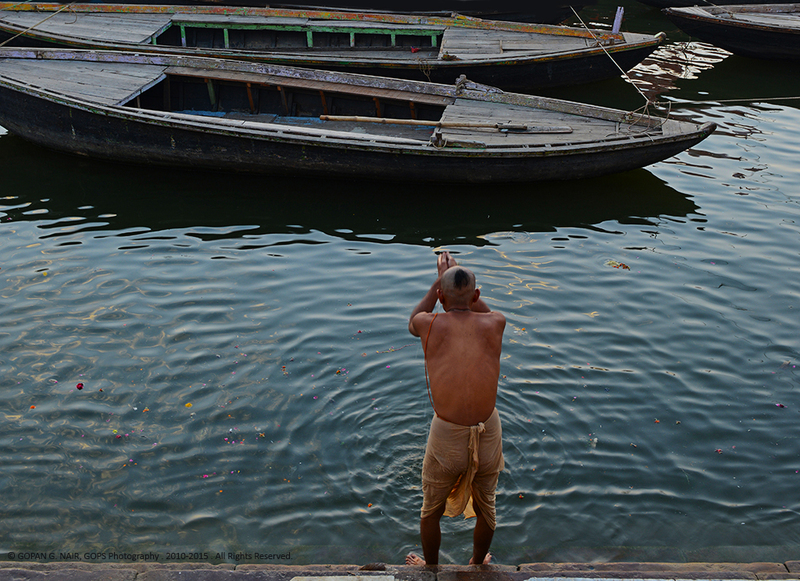 It is interesting to see the way they respond to the calls of the boatmen . 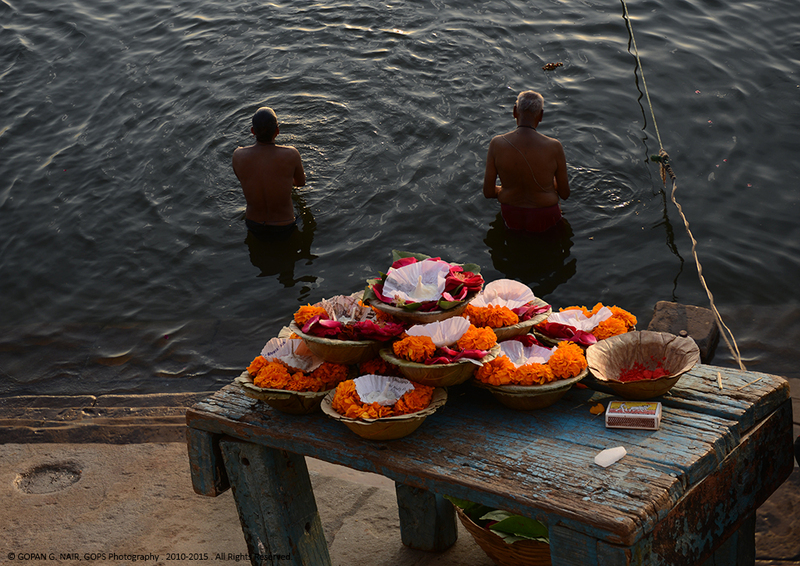 During the ride, you could also buy some floating lamps (diya) and adrift them in the river as an offering. In the evening at 7:00PM, you get a chance to watch the Ganga Aarti (worship) at Dashashwamedh Ghat from the boat. 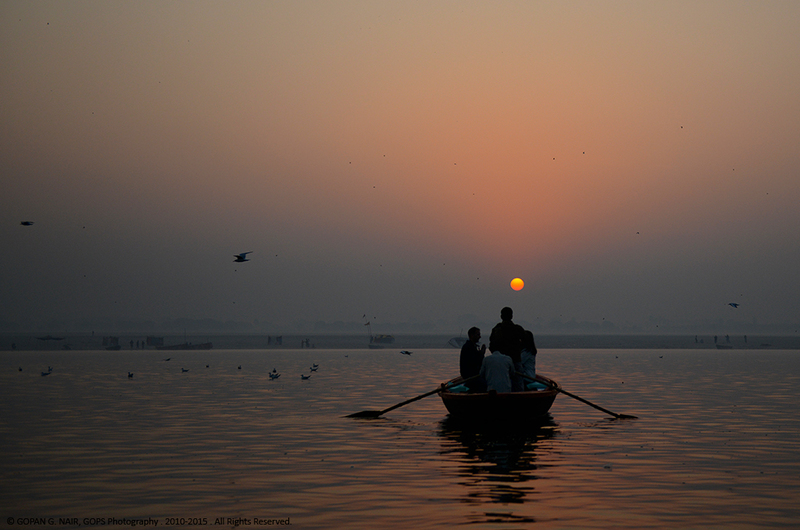 One hour boat ride could cost you between 250 to 300 Rupees. 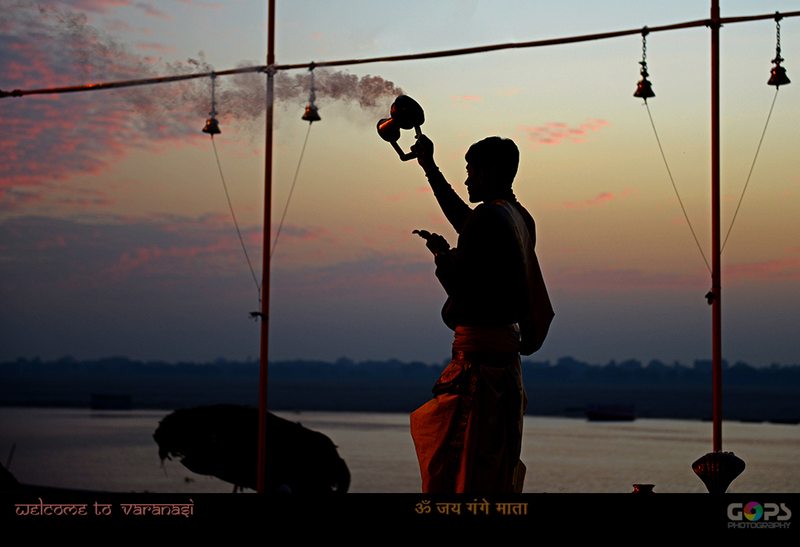 GANGA WORSHIP AT VARANASI IS A USUAL SCENE IN THE MORNING. 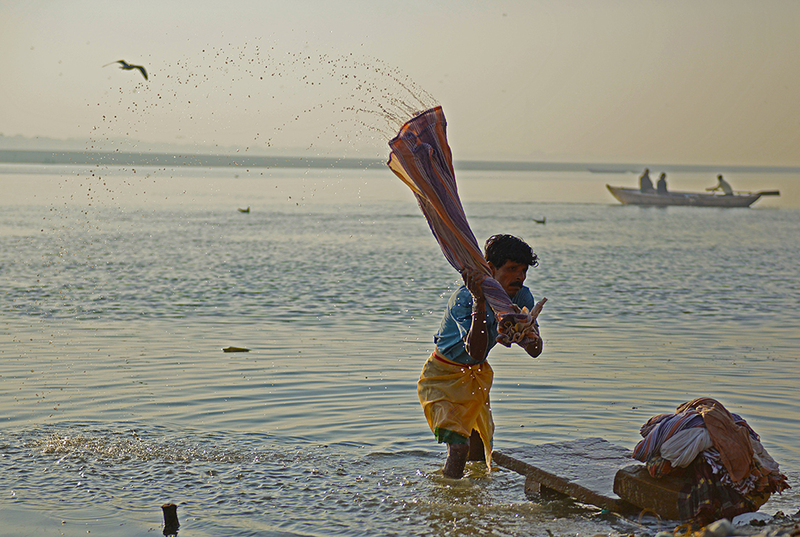 WATER, one of the five elements of nature ( PANCHA BHOOTA ) is represented by a circle which symbolises fullness. 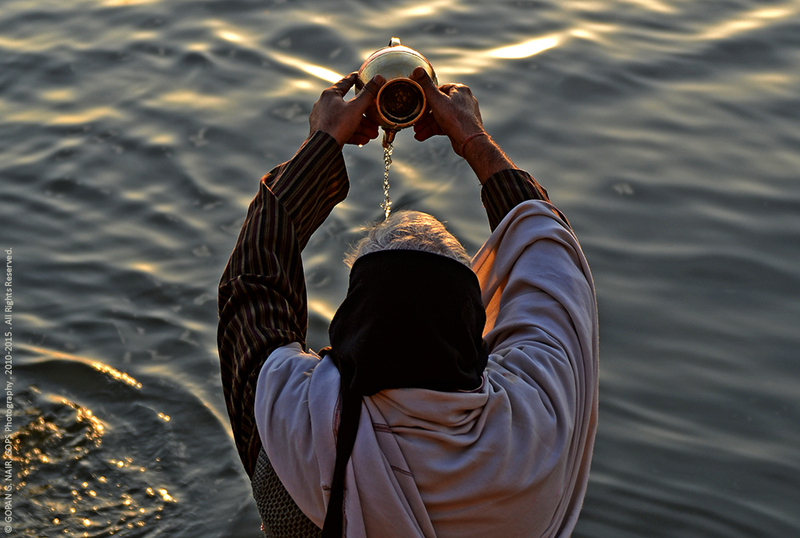 Water is primarily the building block of life and for Hindus, water has been an object of worship from time immemorial. 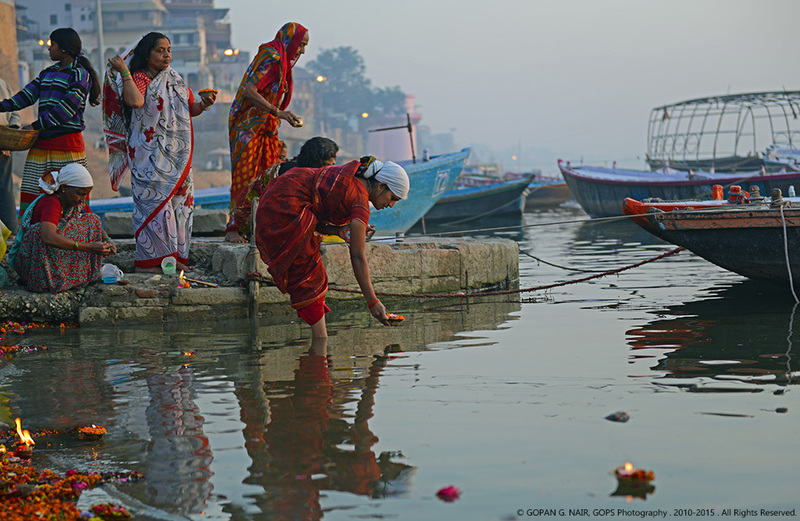 Though heavily polluted and contaminated, a day at the banks of Ganga begins with the worship of water . 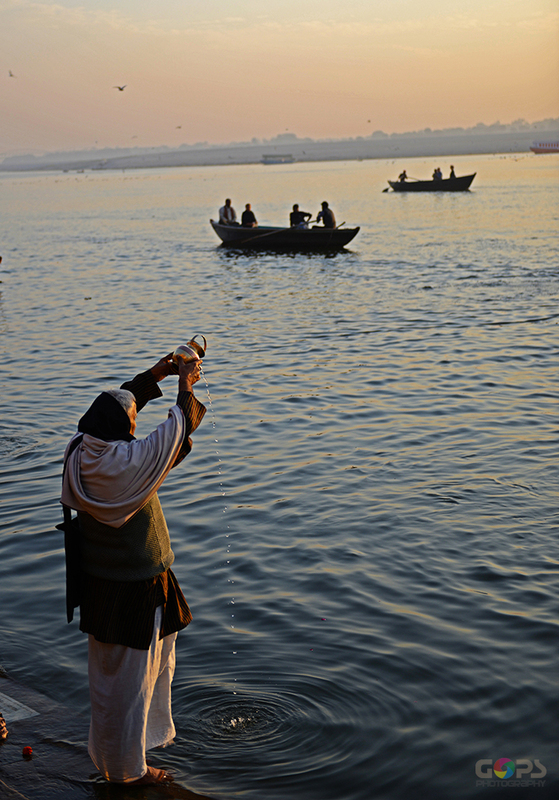 PRAYING AT THE HOLY WATERS OF GANGA RIVER. A USUAL SCENE IN THE MORNING . 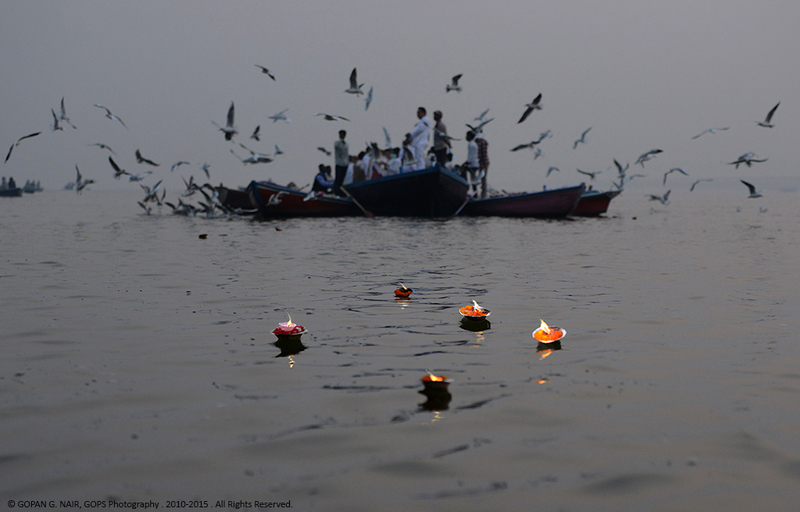 DIYAS OR FLOATING LAMPS WAIT FOR THEIR CUSTOMERS. 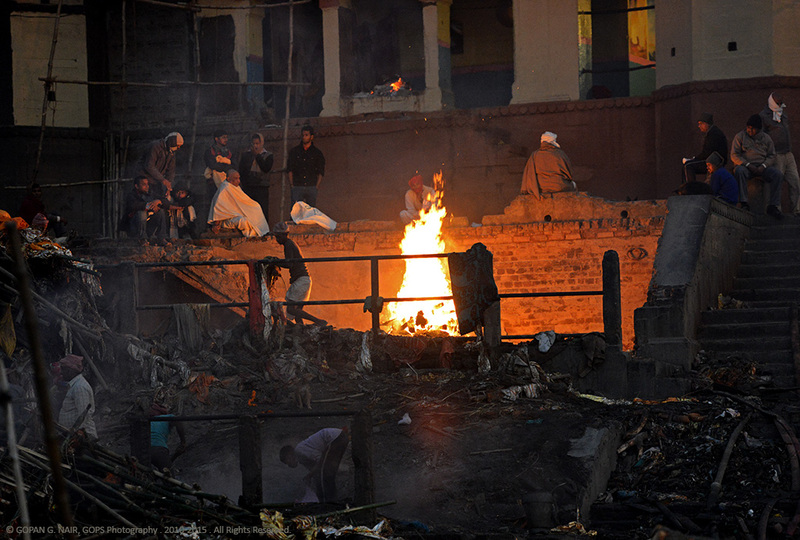 Manikarnika & Harishchandra Ghats are Hindu funeral places where dead bodies are being burned throughout the day and night. You are allowed to watch the ritual silently , but photography is strictly prohibited . The atmosphere is filled with smoke, soot & ash from the funeral pyres and some people may feel uncomfortable here. 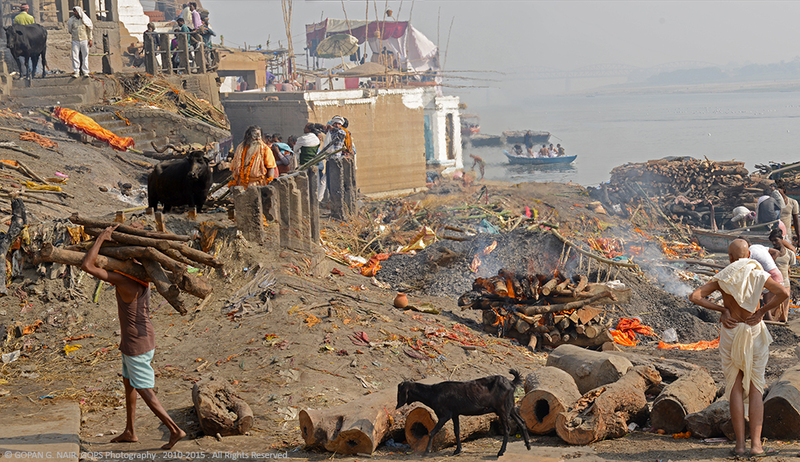 Piles of firewood lie all around these ghats and relatives of the dead could be found bargaining for different types of wood . Rich people can afford costly types like sandalwood . Requirement of firewood is calculated and sold on the basis of weight. 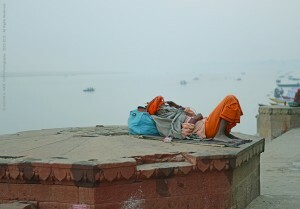 Sometimes if the wood is not sufficient to burn the corpse completely, they may dump the half-burnt body into the river. 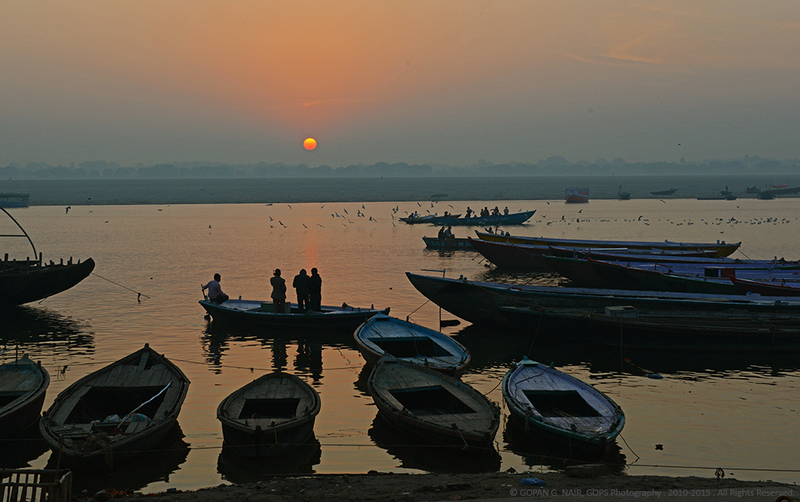 Ganga river is extremely polluted as tons of sewage and industrial waste are being dumped in to the river every day. It seems the levels of Coliform bacteria is over 2800 times the level considered safe by W.H.O. 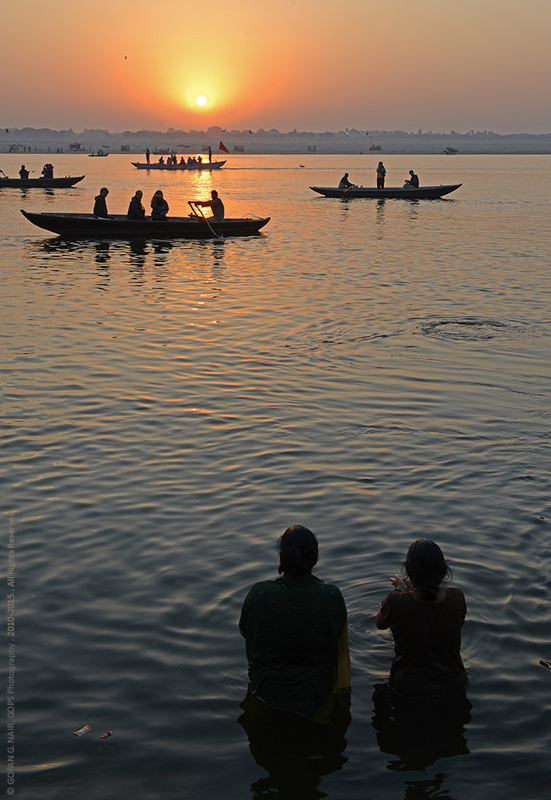 Somehow, in the name of devotion & faith, people still take bath and consume the water from Ganga at Varanasi. 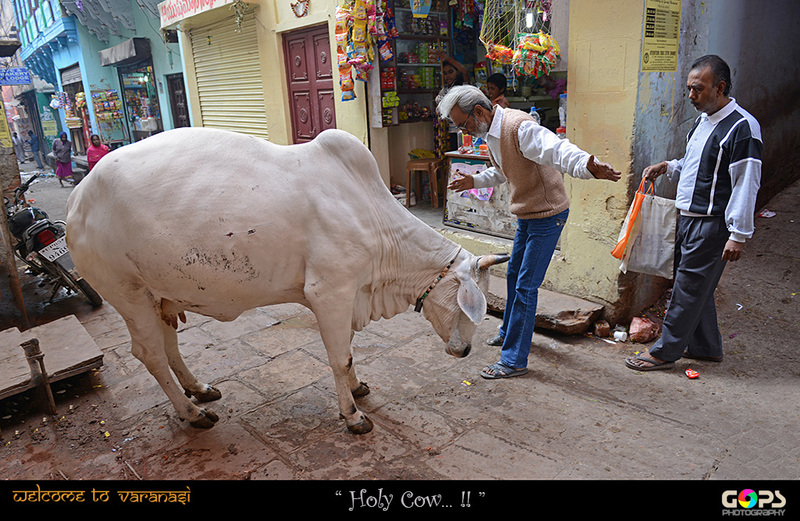 “HOLY COW” : Though the cows of varanasi are usually harmless and peace-loving, a little encounter could happen occasionally in those narrow streets. I was shocked to hear a big ‘bang’ sound and i saw the man giving a hard slap on her left cheek . 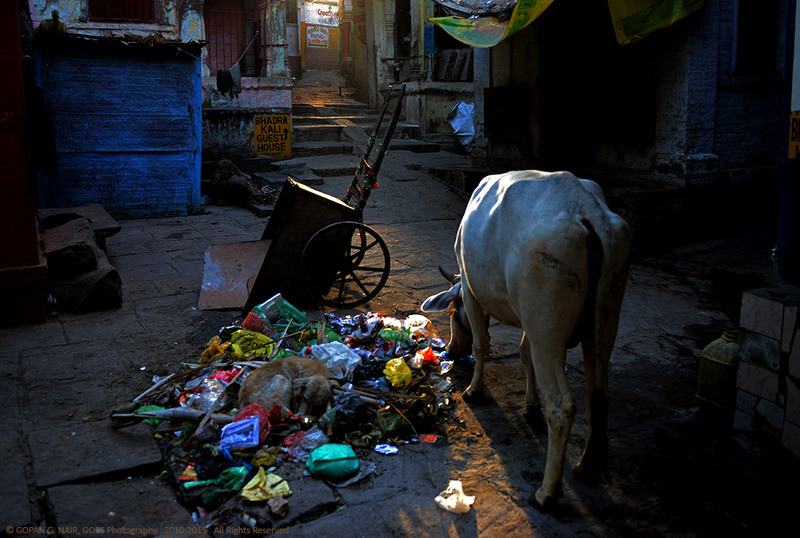 The poor cow did not make any sound and sneaked into the alley searching for her favorite snack in the garbage bin. “दिये जलते हैं, फुल खिलते हैं, बड़ी मुश्किल से मगर…” “SORROWS OF A LITTLE GIRL”. 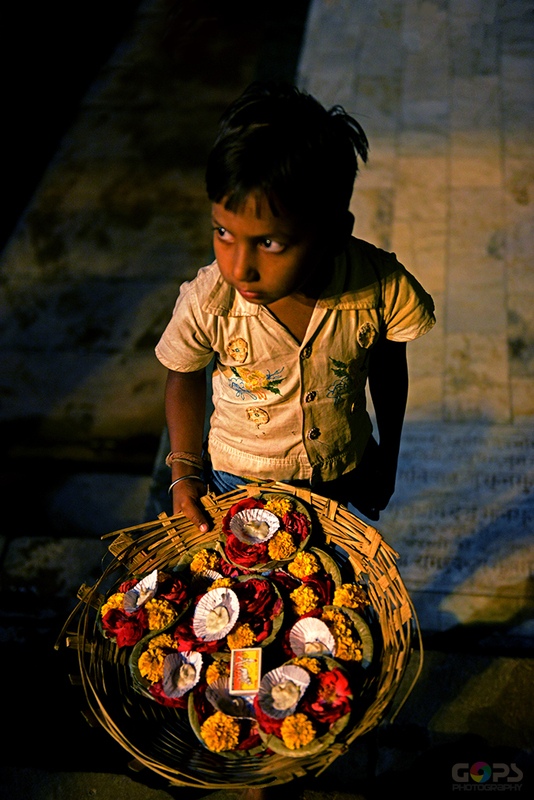 The little girl was selling diyas (floating lamps) at the ghats and an old lady was shouting at her for encroaching into her territory. One of my most favourite captures from this trip. A JOURNEY BACK TO THE FORGOTTEN PAST. OH! YEAH, SOME ANIMALS ARE FASHIONABLE . 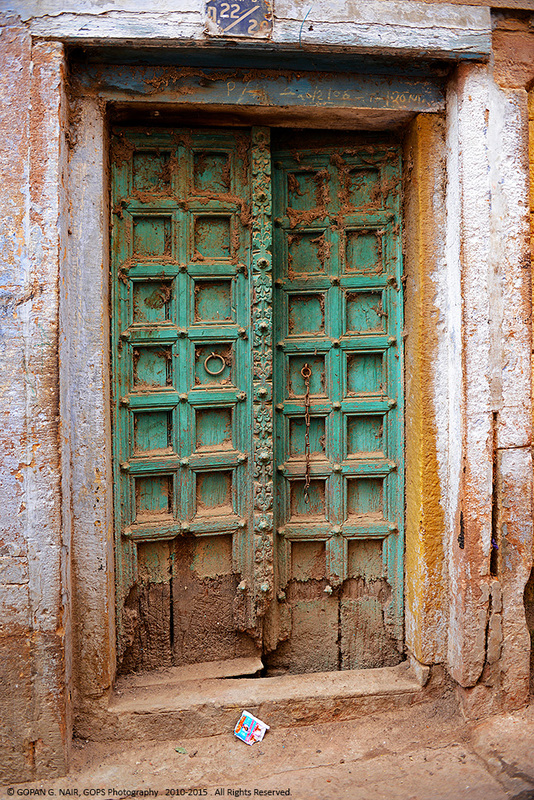 A DOOR THAT TAKES YOU FOR A TIME-TRAVEL. KNOCK AT YOUR RISK..! 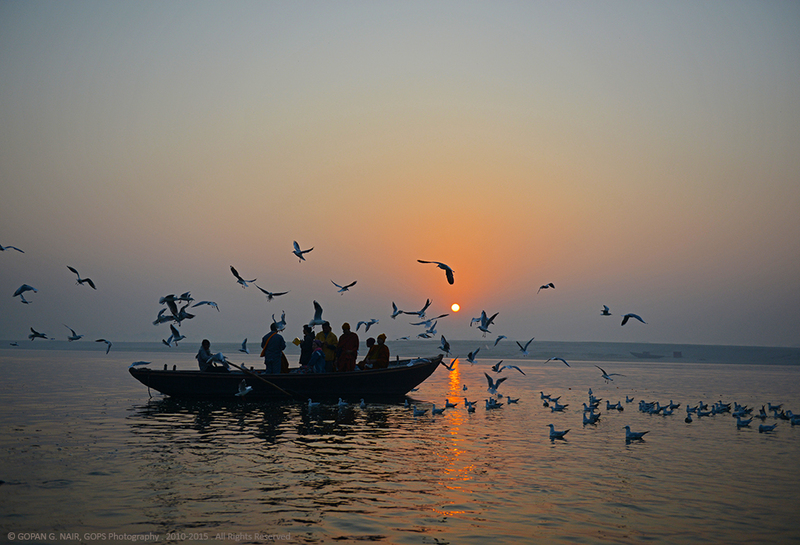 A day at Varanasi starts and ends with the worship of River Ganga. 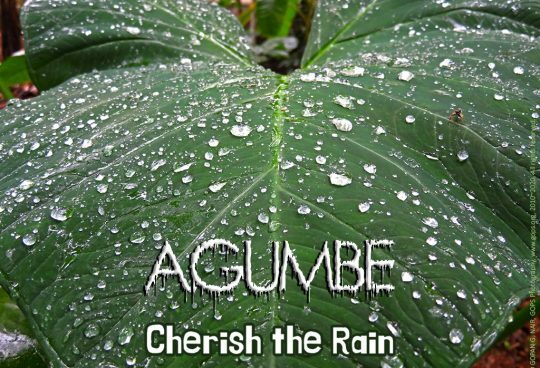 Water, one of the five elements of nature is the building block of life and it has been an object of worship from time immemorial. 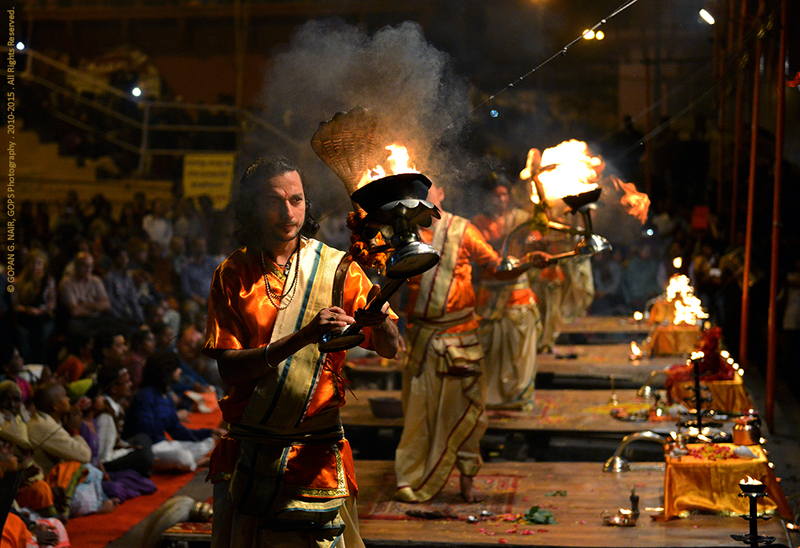 While watching the Ganga Aarti, I was amused by the formation of incense smoke turning into rain clouds which has its duty to pour down, replenish the land below to complete the water cycle. What else should be worshiped in this world ?! BE THE GUIDING LIGHT IN THIS DARK WORLD . FLOATING LAMPS DRIFT ALONG THE RIVER. 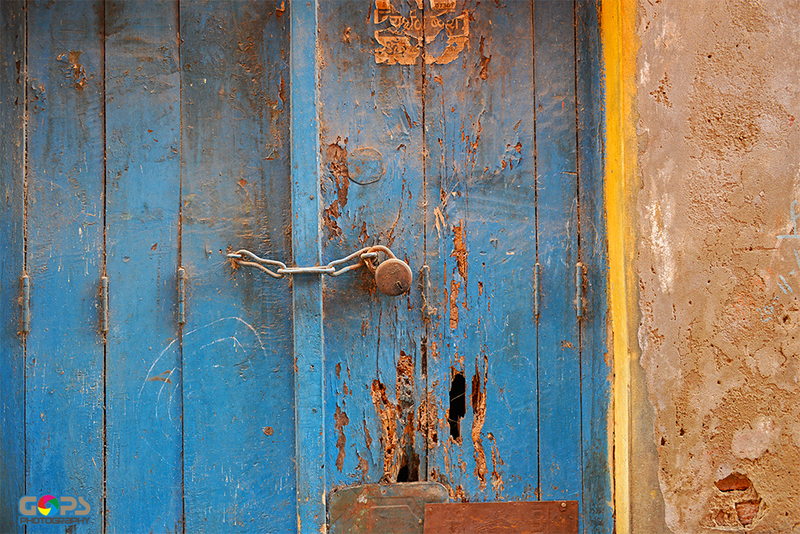 INDIA, A COUNTRY OF CONTRASTS AND CONTRADICTIONS. WHEN TIME STANDS STILL. A PLACE WHERE HISTORY STANDS FROZEN. OH! YEAH. I AM A MACHO MAN. SO WHAT ?! A FRAME THAT SPEAKS FOR ITSELF. 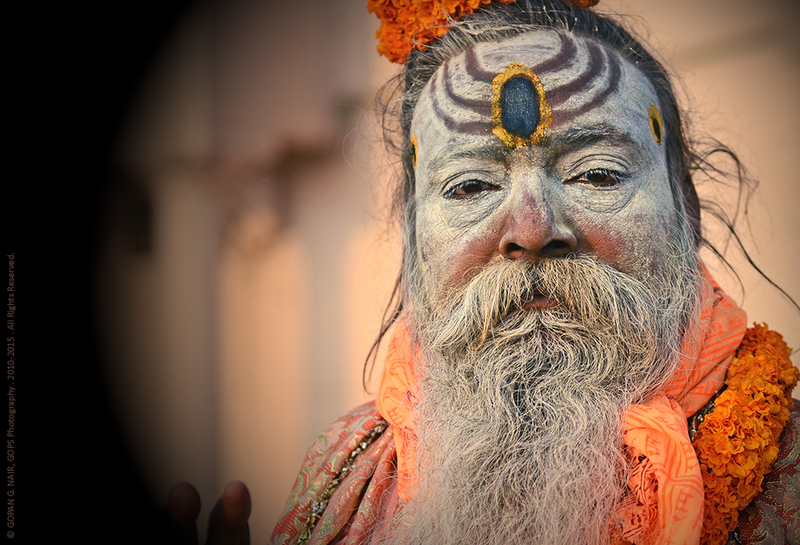 FACE THE ULTIMATE TRUTH AT MANIKARNIKA GHAT. A BODY BURNS AND ANOTHER ONE WAITS. 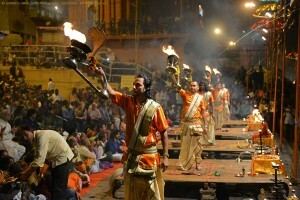 Manikarnika ghat at Varanasi. 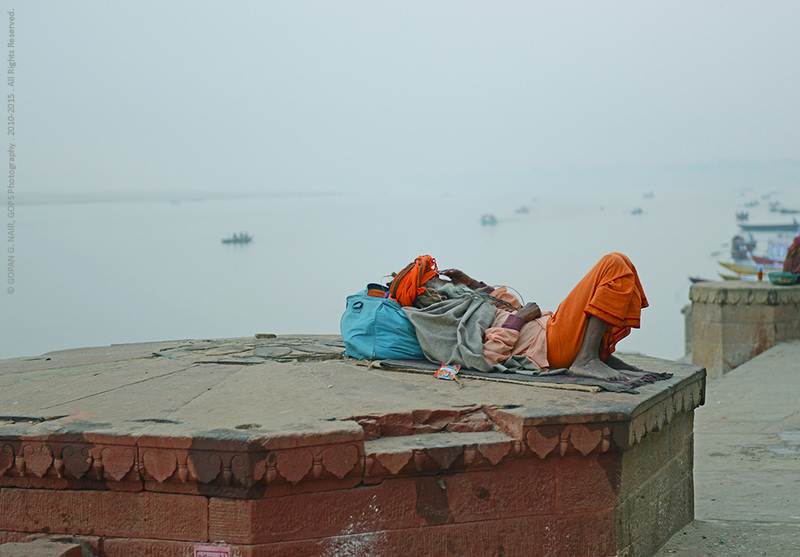 Hindu funeral place by the banks of Ganga river, where dead bodies are being burned throughout the day and night. Look at each element in this frame. A body burns in the pyre while another one waits for its turn. Piles of firewood turn to heaps of ash every hour. 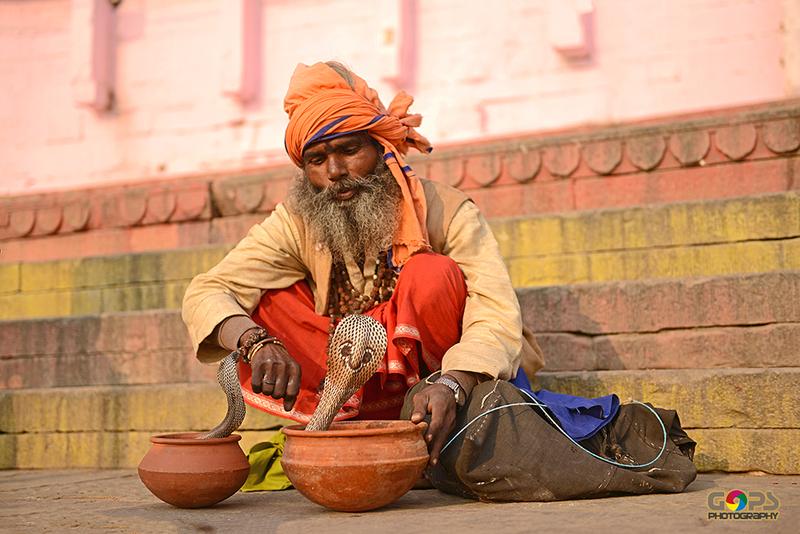 A priest waits to collect the human remains in an earthen pot. 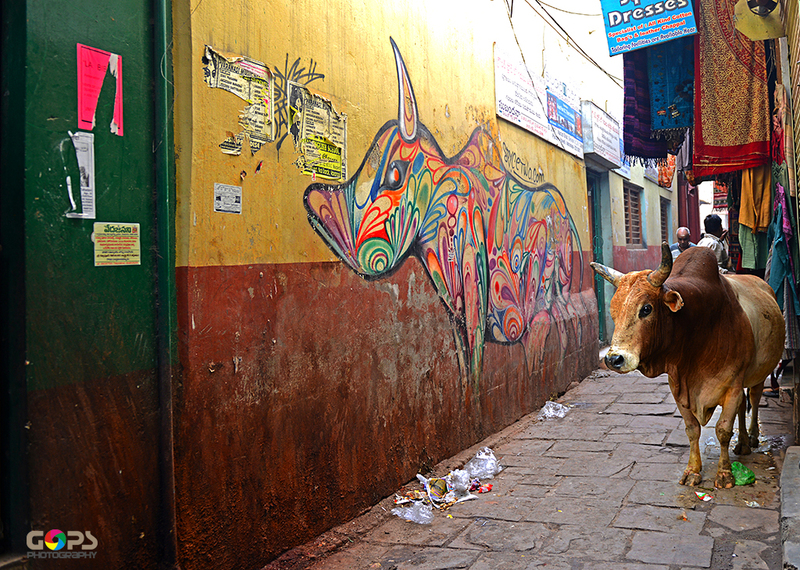 A cow and a goat stick around to chew the flowers that adorned the body. A black buffalo, the vehicle of lord Yama (God of death) watches silently. Heat waves from the burning body blurs the lively backdrop. It sends a shiver down your spine. I have seen the past, present and eternity co-existing in this marvelous city. A mysterious place stuck between life and death…; where you learn that death is so simple compared to this complicated life. In my opinion this is the best of your blogs !!! Simply outstanding, both picture-wise and text-wise !!! Though I have seen most of the pictures in flickr in piecemeal I feel really thrilled to see them all assembled in one place garnished with lovely text. 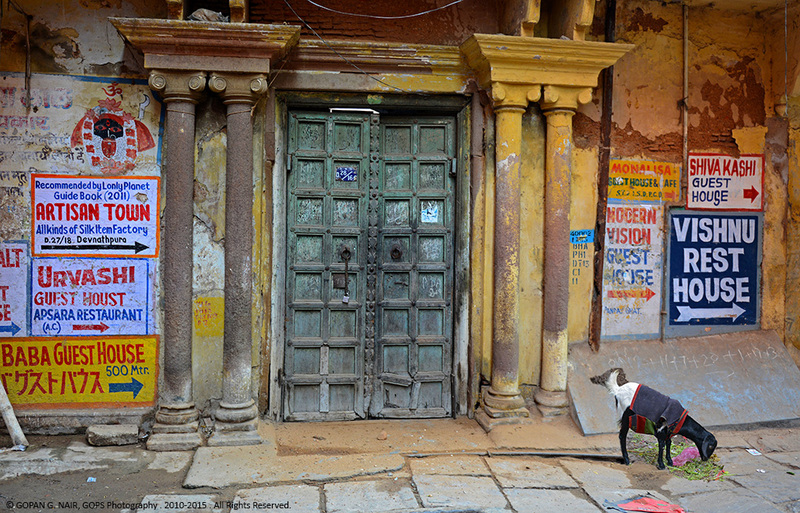 I had been to Varanasi twice but on both the occasions I didn’t take any pictures or seen Varanasi fully (as taking ladies and children with you bars you from having your own plans)!! 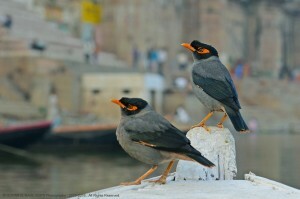 Now after seeing this blog I learnt what to see and shoot !!! And your captions are brilliant especially two of them, “When emptiness fills life” and “United colours of devotion” !!! 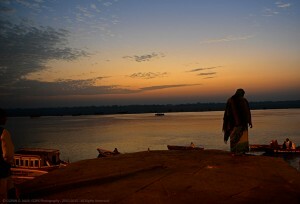 So, let me plan for a trip soon and hope Vishwanath sends the call !!! 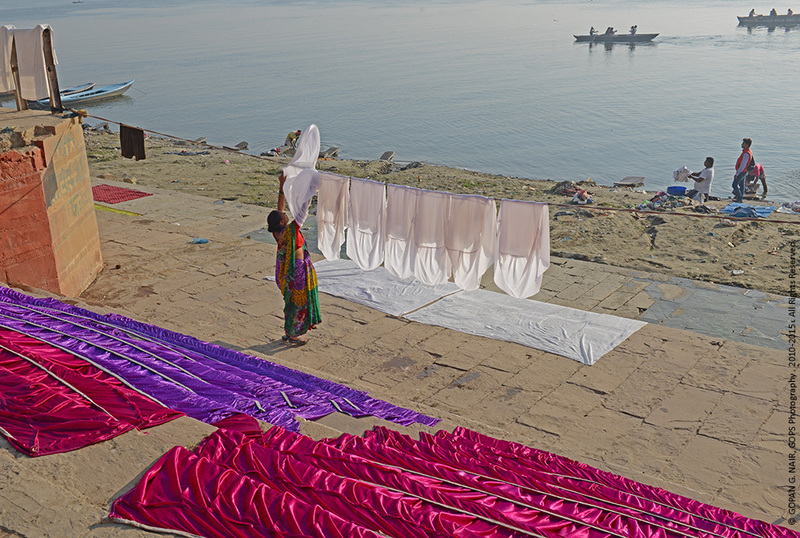 Why don’t you think of bringing out a coffee-table book with these wonderful images ? Just think !!! Thank you very much, dear Ezhil Sir for your usual support & encouragement . I consider this as a great honour. Let me congratulate to you for this perfect piece of literature. Fantastic pictures add glory to that too. Indeed a classic blog page. Your comment made my day ! Thanks again and again for your valuable visit & feedback. Splendid ! Really loved going through your lines. 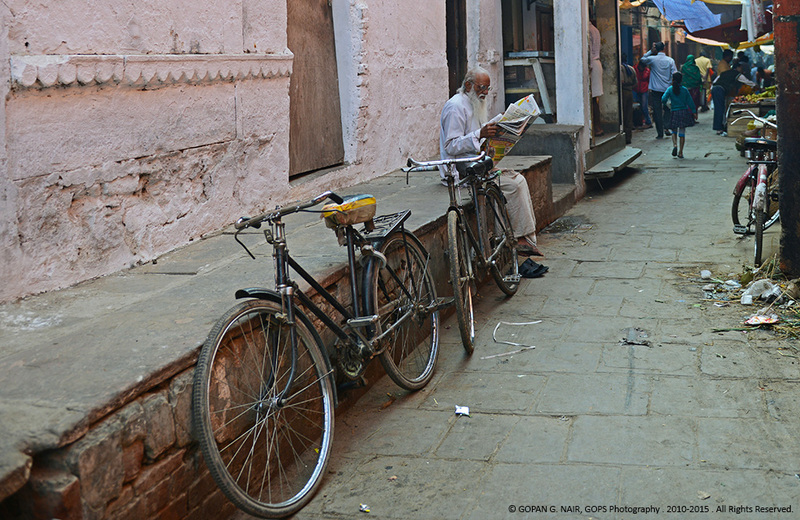 We felt as if we were passing through the narrow streets of Kashi. A special mention for those amazing pictures. Keep up the great work. Glad to know that you liked it. Really appreciate your comments. 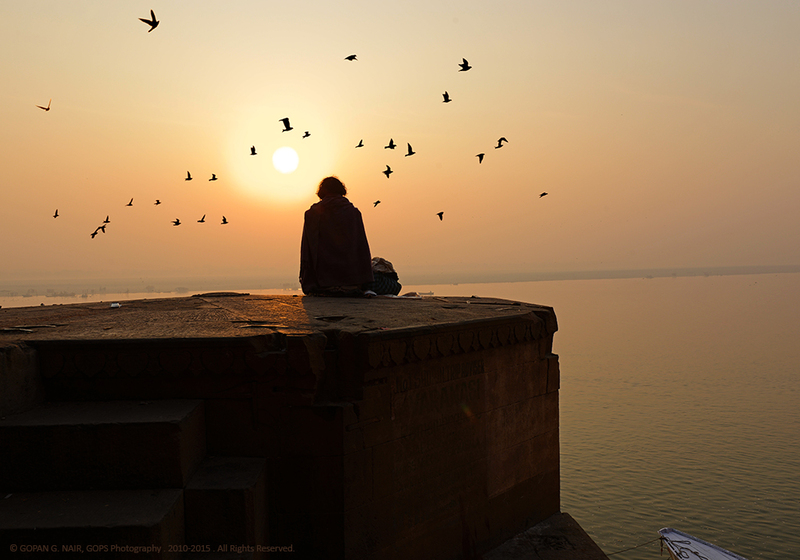 You have succeeded in absorbing the heartbeats of this holy place and to convey that artistically. 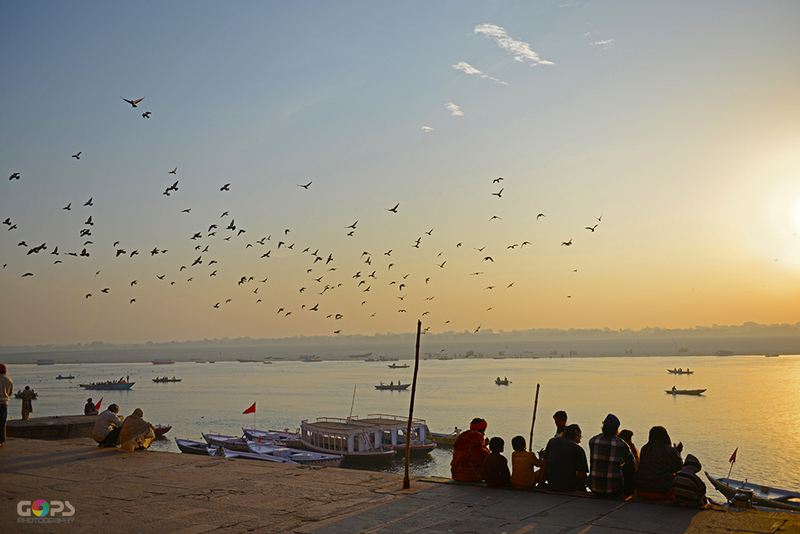 We have now moved to Varanasi to learn music. And Yes!, as you had written, we do believe that you need to get that special invitation to reach this destination. That’s very encouraging. Thank you very much & wish you all the success with your Indian adventures.